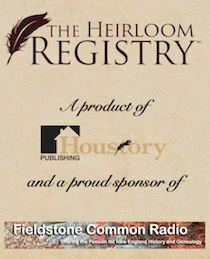 The most recent episode of Fieldstone Common featuring Nancy Rubin Stuart discussing her book Defiant Brides: The Untold Story of Two Revolutionary-Era Women and the Radical Men They Married is now available as a podcast. 9 May 2013 at 1pm EST For Adam’s Sake with Allegra di Bonaventura. In this engrossing narrative of family life and the slave experience in the colonial North, Allegra di Bonaventura describes the complexity of this master/slave relationship and traces the intertwining stories of two families until the eve of the Revolution..
16 May 2013 at 1pm EST Judith Sargent Murray with Barbara Silberman. 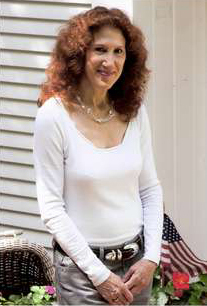 Judith Sargent Murray was an 18th century essayist who believed in equal education, a woman’s right to work outside the home and equal roles between men and women in marriage..
23 May 2013 at 1pm EST The Indian Great Awakening with Dr. Linford Fisher. 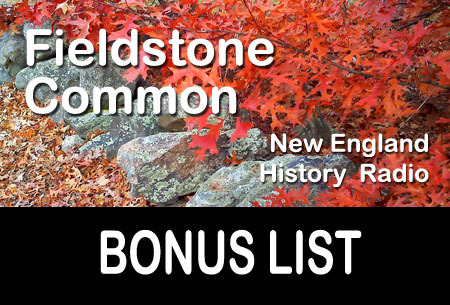 The First Great Awakening was a time of heightened religious activity in colonial New England. Among those whom the English settlers tried to convert to Christianity were the region’s native peoples. In this book, Linford Fisher tells the gripping story of American Indians’ attempts to wrestle with the ongoing realities of colonialism between the 1670s and 1820. 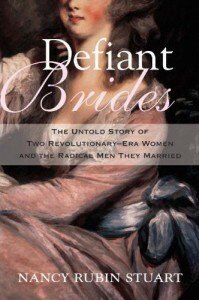 30 May 2013 at 1pm EST Defiant Brides with Nancy Rubin Stuart. In Defiant Brides, the first dual biography of both Peggy Shippen Arnold and Lucy Flucker Knox, Stuart has crafted a rich portrait of two rebellious women who defied expectations and struggled—publicly and privately—in a volatile political moment in early America.